So I came across this post from Matt McGee that states that one-word searches were up in 2009. This is based on data from Hitwise stating that single word searches increased by 17% in 2009. While longer searches, for the most part, declined. This goes against data that was shared from some of the major search engines during the past year. 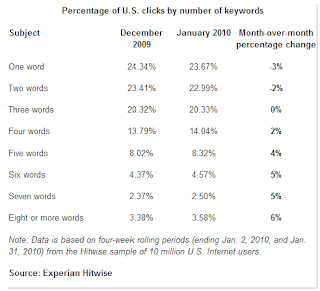 I was at SES NY 2009 in March and a couple of representatives from the major search engines shared data that suggested users are searching by using more keywords in their queries. This makes total sense as searchers become more savvy in using the Web. Single word searches actually dropped by 3% during this period. Before you go off and start thinking that long-tail is dead, think again. Long-tail keywords still drive more qualified traffic and still tend to perform better in terms of conversions. I would expect us to see an increasing trend in the length of search queries that people conduct. As we have discussed in the past, an ideal keyword strategy should focus on head (typically one or two word general queries), torso (typically a three to five word query) and long-tail (typically a three or four plus word query). Depending on your target audience, you will need to determine the best balance there. Also depending on the stage of the purchase funnel that the searcher may be at, the more specific their queries might be. The fact is, is that single word keyword searches will also be popular as users begin their quest for information online. According to the most recent data from Hitwise, 67% of searches are for three or less words. This is definitely an interesting trend to watch, the fact is that long-tail optimization is not dead and that while single keyword searches continue to have the greatest share of all searches, users are incorporating more keywords into their search queries. This trend will continue in 2010 and beyond as the typical user of a search engine become more efficient at browsing the Web and searching for their information. New Orleans Saints to Win Super Bowl XLIV? Google & Apple: Allies No More?